For the second year running, Bandon's Chapel Steps tops the restaurant charts. This year's post didn't score quite as high as the 2012 review but still, thanks to the many fans of this lovely restaurant, came out ahead. Good performances too from newcomers like Brendan Cashman's Gallo & Galettii in Wilton, Finn's Table in Kinsale, and the Greenroom at Sage in Midleton. Electric is tops in city centre, Cafe Gusto is leading cafe while the Sultan is best ethnic. Kinsale's Black Pig Wine Bar is the place to go for a glass of wine (and a meal), the newcomer quickly establishing itself at the head of affairs. This was the Year of the WineGeese and great to see the visit of Cullen Wines to Cafe Paradiso featuring as does the series' opening night at L'Atitude 51. 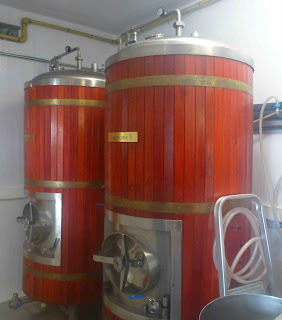 The rise of craft beer is underlined by the popularity of the post on the Cotton Ball, Cork's newest micro-brewery; this post, just up a week or two, is gathering in the hits even as I write. Electric. Easy to Book. Hard to Leave. Ummera Smoked Chicken (served with a Cajun Potato Salad). Lovely contrast after days of turkey! Rwandan Coffee, the Cup of Excellence award winning Maraba Sovu 2012 lot #14, via Robert Roberts Connoisseur Club. 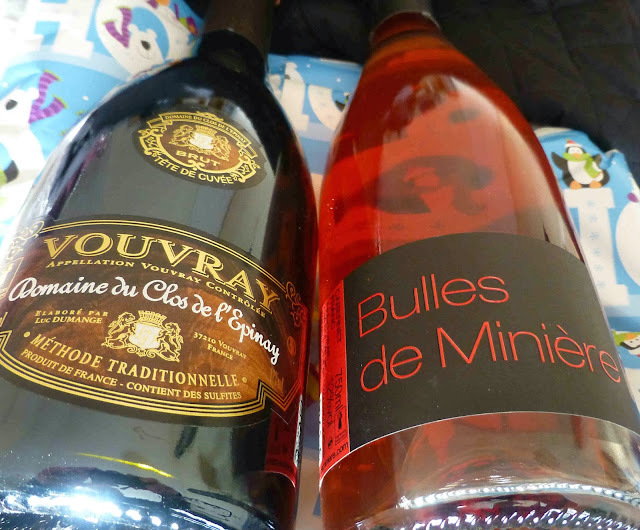 Organic Pink Bubbles (made from Cabernet Franc) from Chateau Miniere and Domaine du Clos d’Epinay Vouvray Brut. Souvenirs of the summer holidays in the Loire Valley. Mella’s Rum & Raisin Handmade West Cork Fudge. 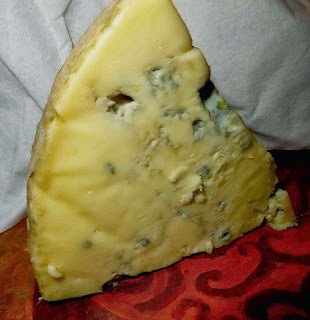 Cashel Blue mature and Warre’s LBV Port (2002). The Cornstore’s Plum infused Whiskey. 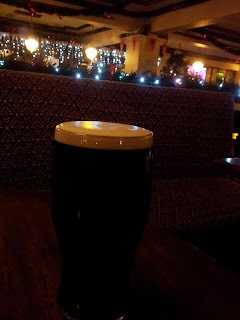 Dungarvan Coffee and Oatmeal Stout, by now a Christmas standard. Eight Degrees Zeus Black IPA, 7%. Looks like a rich dark porter but tastes like a pungent IPA. 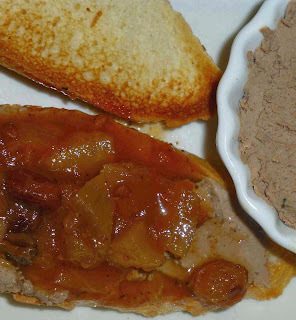 Fleming’s Orchard Chutney (Apples, Pears and Green Tomatoes from their own orchard). Barrie Tyner’s Pates (from the local Farmers Markets, inc. Mahon). Pandora Bell’s Honey Nougat with Almonds and Pistachios. These are the most visited posts from all my sites for the year 2013. 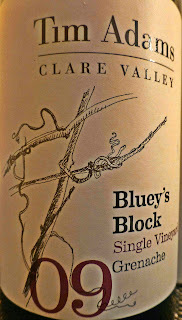 Quite a mixed bag and some surprises too! It was a busy holiday lunch-time in Electric. But all was calm, bright too for a spell with the brown river surging by outside in the south channel. The calmness inside though had nothing to do with the weather, just the efficiency of the team in this popular South Mall Restaurant. Busy as they were, they got it all right at our table. I hesitate to use the word efficient as it sometimes comes with a “clinical” or/and “cold” attached. Here, it was warm, efficient yes but with time for a chat. Indeed, the calmness starts with the Electric booking procedure, even if you are dealing with an electronic system (you do of course have the option of picking up the phone and talking to one of the staff). Otherwise, using your phone, tablet or laptop, just fill a few boxes (name, number of diners, date and time) and you have instant confirmation of your table and a reference number. The system is easy. Before I fall into the trap of telling you all about the place and little about the meal, I'd better get on to the grub. My date was towards the end of the holiday rush but none of the Christmas cliches appeared on the regular menu. Must say that the lunch menu is quite varied and very well priced; the “Little Bites” are tempting and especially good value; the mains follow suit. You may have three courses for €21.00 and may also “swap” starter or dessert for a glass of wine. My Little Bite, actually it was quite a decent sized starter, was the Lamb Tagine. It came in its own pot with lid and was superb, a terrific balanced mix of top notch well-cooked lamb, chunky apricot and veg and a lively spice (nothing extremely hot at all). Wouldn't mind trying that as a main course! 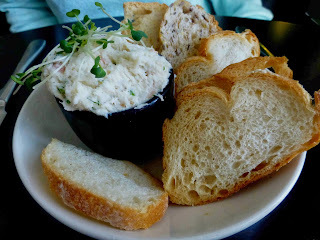 Our other Little Bite was the Electric Fish Paté, a very flavoursome tub of white crab meat with some nicely toasted breads. Quite a bit of eating in that tub but it was a delicious delight! And the high standard continued into the main courses, both vegetarian by the way. 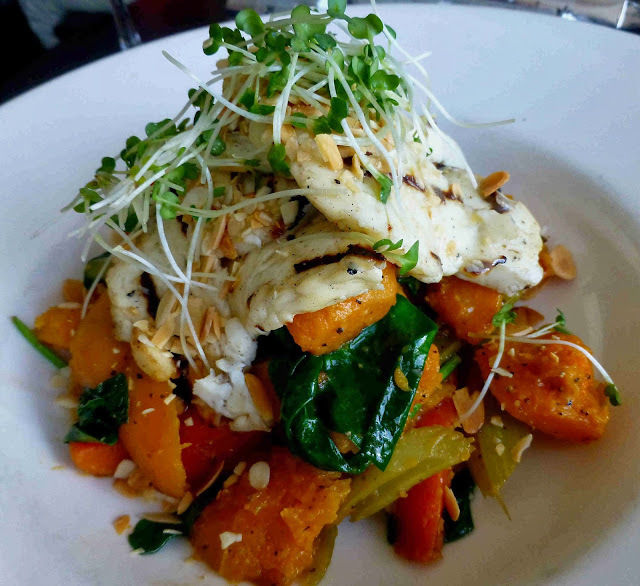 Myself and Halloumi have been seen a lot together recently and the love affair intensified at Electric thanks to this combination: Grilled Halloumi Salad, with winter root vegetables (mainly butternut squash, carrot, celery), toasted almonds and sweet pear dressing. Full of colour, textures and flavours, this was a superb dish from start to finish. 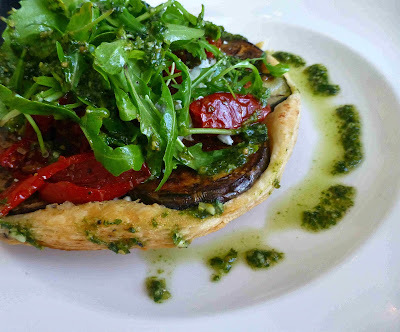 Chargrilled Aubergine and Courgette Tarte Tatin with sun dried tomato, feta cheese and pesto dressing was our other mains and this too was very impressive, another very well judged dish. Looked well, tasted well. Thanks to Head Chef Leona Robinson, Restaurant Manager Triona Hennessy and all the team at Electric for a lovely Christmas lunch! Happy New Year to you all. 20% of our tables are available for walk-in customers. For more, simply enter Electric into search box at top left. Happy Christmas and wishing you all the best of luck in 2014. Press here to get lucky! Forward planning. 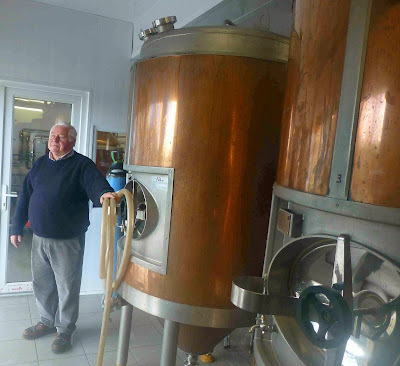 Jack Lynch in the Cotton Ball Brewery. Months of research and hard work paid off this week when Ireland’s newest craft beers began to flow at the Cotton Ball Brewery in Mayfield. The Cotton Ball pub, under which the brewery is built, was the venue for an early tasting of Lynch’s Lager, called after the family that founded the pub back in 1874. While touring the new facility yesterday with Jack Lynch, I was shown a number of barrels previously used by Jack Daniels (and to be used in the future for a Lynch special brew). 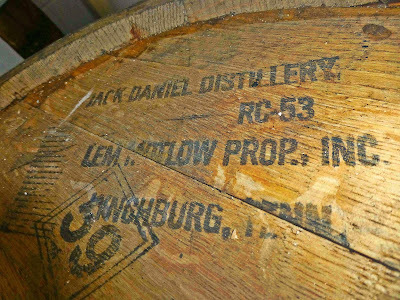 At least one of the barrels, Number 59, is stamped with the name of the American distillery and the address is Lynchburg, Tennessee, and that is one of the places where Jack Lynch’s grandfather, Humphrey, worked while in the United States in the 19th century. And it is Jack's son, Humphrey, who is the Cotton Ball brewer. A lot of lager here! More beers are planned but, for now, there are just two, a Lynch Lager and a Lynch Stout, and these are exclusively available at the bar and at a very good price, I might add! My first venture was a pint of the lager. It is superb, full of great flavour and with a good cut in the finish. The Stout (left) is also excellent, flavour, smoothness and a long dry finish the striking characteristics. You get the hints of your old toffee bar in the aromas and on the palate and the flavours last, still a pleasure well after the swallow. Both beers are available on draught at the bar but you can expect to see them in bottles sometime in 2014. Aside from the special, an Ale is planned for the New Year and should make an appearance as the Spring kicks in. And there are also plans to increase the food element at the Cotton Ball and indeed produce specially matched bites for the beers. 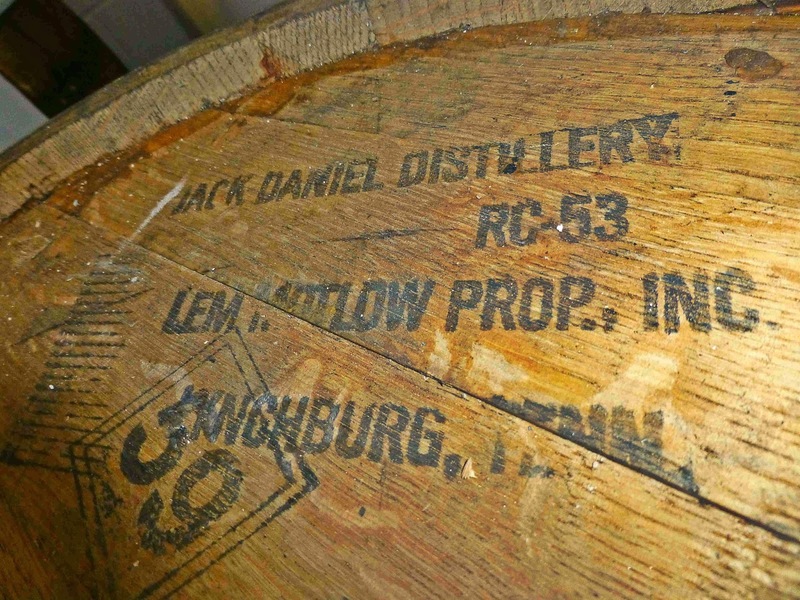 This barrell has quite an aroma, all the way from Lynchburg to Lynch's! 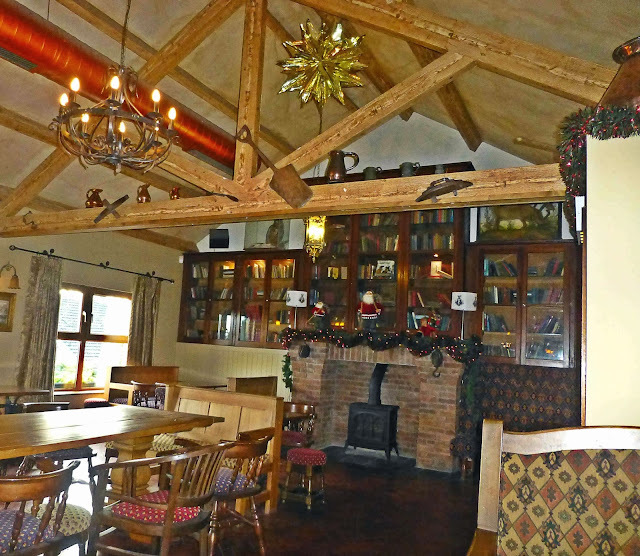 The brewery will be officially launched on January 25th (6.00pm to 9.00pm) when you may try the new pints, enjoy the music and the new food menu. Just to go back to Humphrey and his working trip to America. One of the souvenirs he brought back was a full size Stars and Stripes with 39 stars on it. This is an oddity as there were never 39 states in the union. 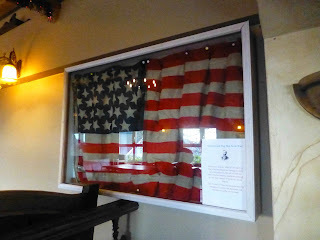 The legend in the photo says the flag manufacturers took a gamble thinking that the Dakotas would be admitted as one state but instead North and South Dakota simultaneously joined the union as two separate states, taking the numbers from 38 to 40. The flag is displayed in one of the loveliest corners of the Mayfield pub, a corner that Jack says will now be called the Brewery Room and one that will contain quite a lot of Brewing memorabilia in the months ahead. Must say I am looking forward to visiting on a regularly basis to keep an eye on what Jack and his sons Eoin and Humphrey are bringing up from underneath. It is no great hardship to me. The walk is short and the beer is good. Happy New Beer! Hand crafted from 5 malts and traditional flaked barley. Bittered moderately with American and New Zealand hops. Late kettle hopped with premium Kentish aroma hops beer. Warm matured on the same aromatic hops, after which the beer is cold matured on Jack Daniels impregnated American oak. A phenomenal marriage of coffee roast, caramel, lush, balanced by a clean bitterness exploding into a tangerine, mandarin aromatic delivery with the faintest hint of oak. Pilsner lager made with 100% Cork malted barley ,is clean Bittered with Columbus and galena U.S.A grown hops. Late kettle addition of hallertãu perle and hersbruker, fermented with our rapidly settling yeast strain. With a proven record of making clean cut pilsner lagers portraying the individual hop aromas from New Zealand to Norway and the east and west of Europe. Another unchallengeable quality lager delivering, subtle aromatic hop flavour and aroma from a bed of light malt caramel flavour with a thirst cutting clean bitterness. What is your favourite Christmas Beer Moment? Some opinions here. It’s a cold crisp day in the city as we enter the warm buzz of Isaac's Restaurant in McCurtain Street. This place is one of the longest standing businesses in this city centre street and you get a hint of the reasons behind this relative longevity from the courtesy and warmth of the welcome. Indeed, the service overall for this lunch-time visit was friendly, chatty and efficient. And the food was excellent. 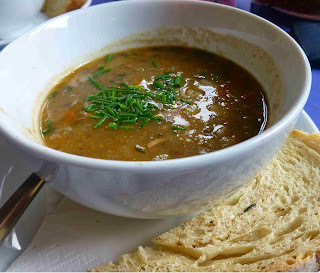 It is, of course, the season for game so I decided to go for the Pheasant and Lentil Soup. 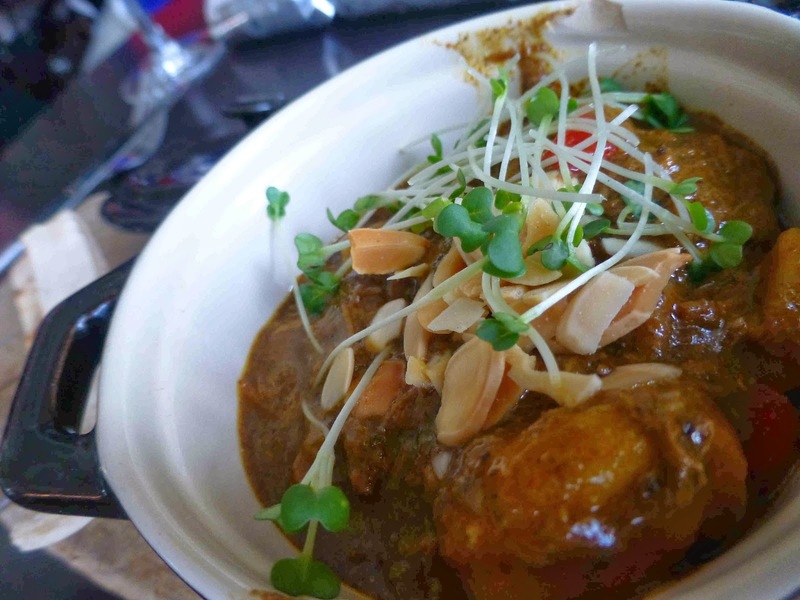 The bowl was loaded with little bits of pheasant and it turned out to be a superb match with the lentils, and a body warming one as well, great flavour and texture. The main course, that Mild Madras Curry, was something special. I got a dish of the loveliest lamb, well cooked and tender and no shortage of it. 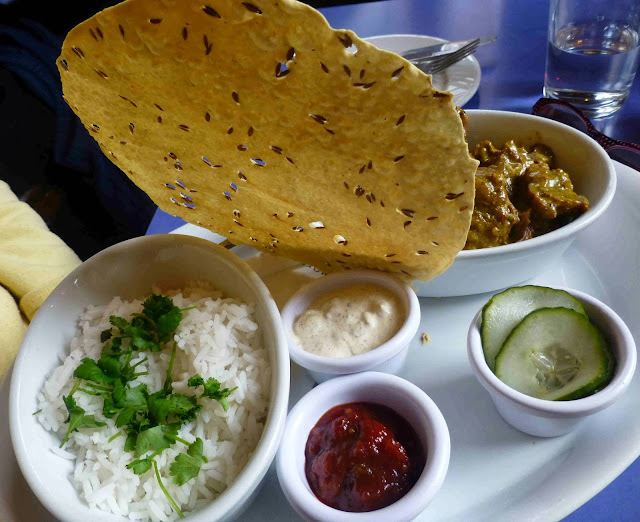 Three small dishes to dip into and a dish of rice were also served u,p along with a very tasty poppadum. Spent a good while at this, tried every combination of dip with the lamb, and enjoyed every bite. Had my eye on that Prune and Almond Tart but, pleasantly full, decided that discretion was the better part of valour on this occasion. Very happy with what we'd had and had another chat on the way out as we settled up, €43.00 for two courses each. Very Highly Recommended! Isaac’s Restaurant on McCurtain Street, has been a standard-bearer for good food in Cork for nearly 21 years. 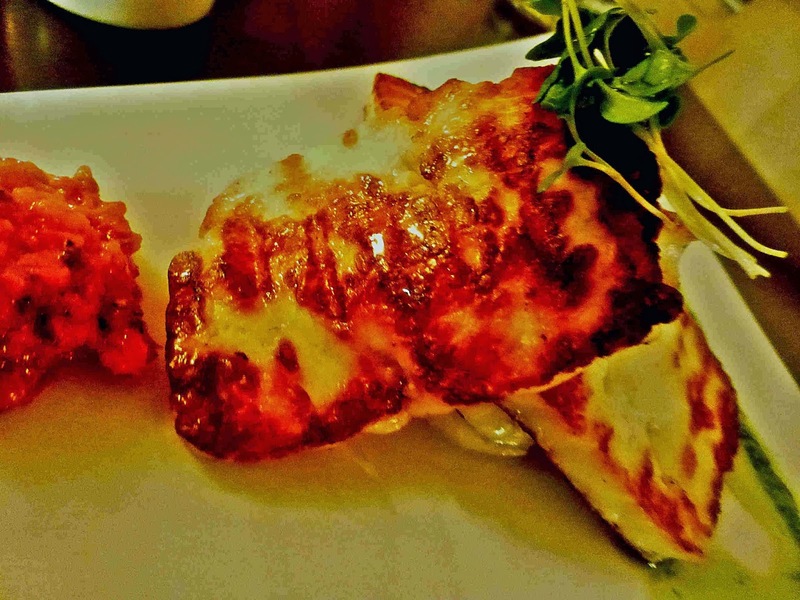 Established by Michael & Catherine Ryan & Canice Sharkey it has developed into a lively restaurant receiving great acclaim. 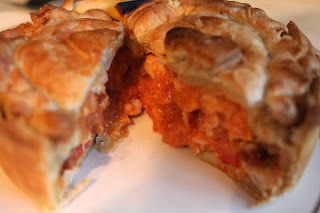 Una's Pies are becoming widely available though it was from her regular Mahon Point Farmers Market stall that I bought this Chicken, Chorizo and pepper beauty, a real warmer-up on a cold winter's day and our Taste of the Week. No wonder she has been picking up Blas na hEireann awards in Dingle for the past three years, including Artisan Producer of the Year in 2011. 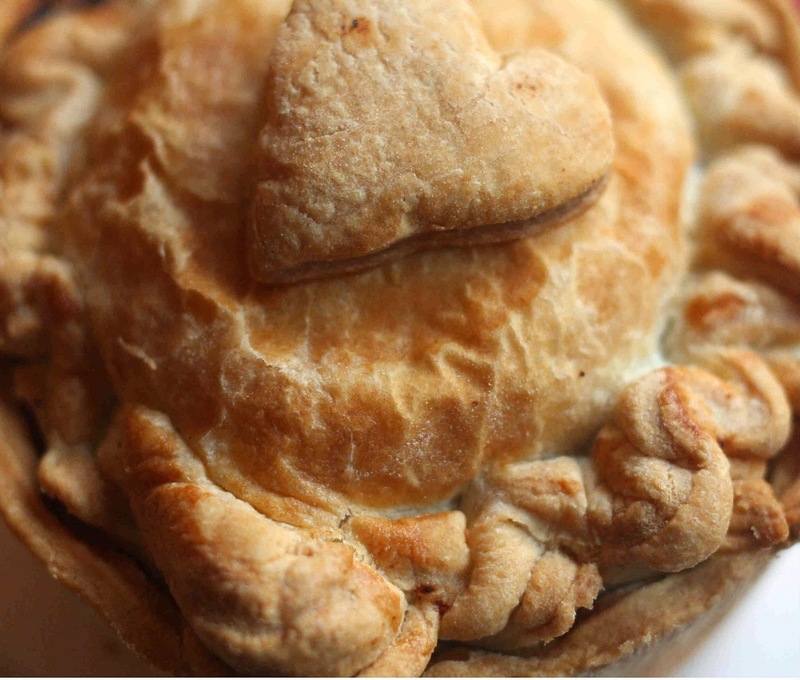 The pies are produced in Cork "with the finest Irish ingredients and using suppliers we know and trust". The chorizo in this one comes from Gubbeen and the pastry is absolutely gorgeous. A pie full of flavour and my current favourite. 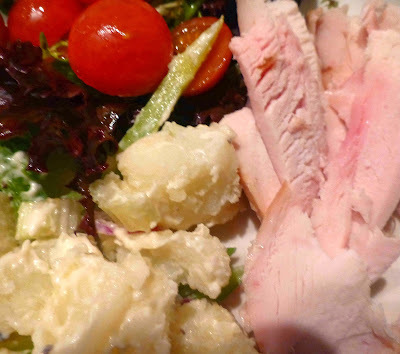 But that could change as Una has quite a list to choose from including Chicken,Leek and Cheese; Steak & Murphy's; Chicken Thai Green Curry; Chicken and Asparagus; Roast Veg and Goats Cheese; 4 Bean Chilli; and Chicken and Mushroom. 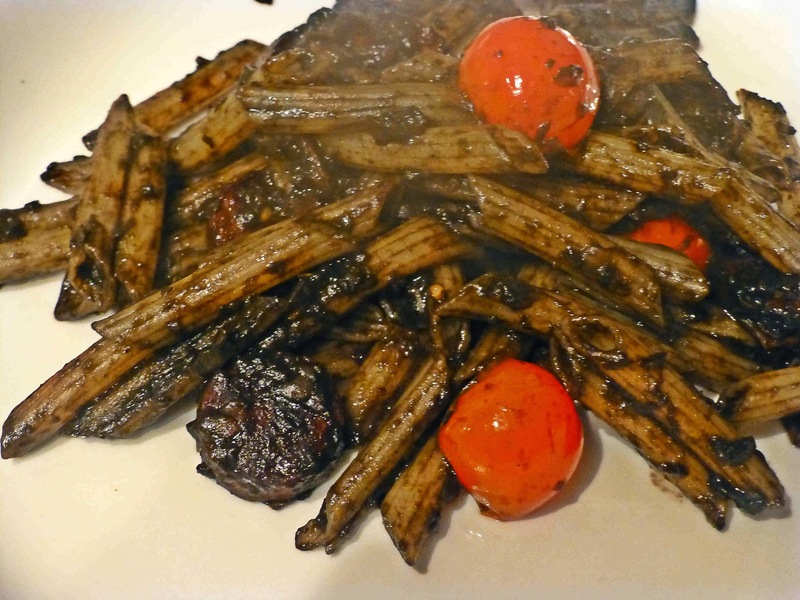 Do you like black on your plate? A wee jar of Squid Ink. Getaria. The shop is on the right! Black is not a colour I'd normally see on my plate unless of course it is black pudding! 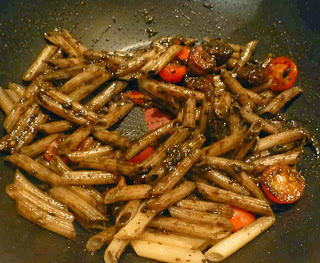 Indeed, it can be hard to get over the colour barrier that a dominant black presents in a dish. And so it was with some trepidation that I screwed the cap off a small jar I bought the summer before last in a small town, Getaria, on the beautiful coast of North West Spain. The label said, Salsa de Chipiron, and the gooey contents were pure black. Translated the ingredients and it read: Onion, Olive Oil, Water, Tomato, Squid Ink, salt and spices. But what to do with it? 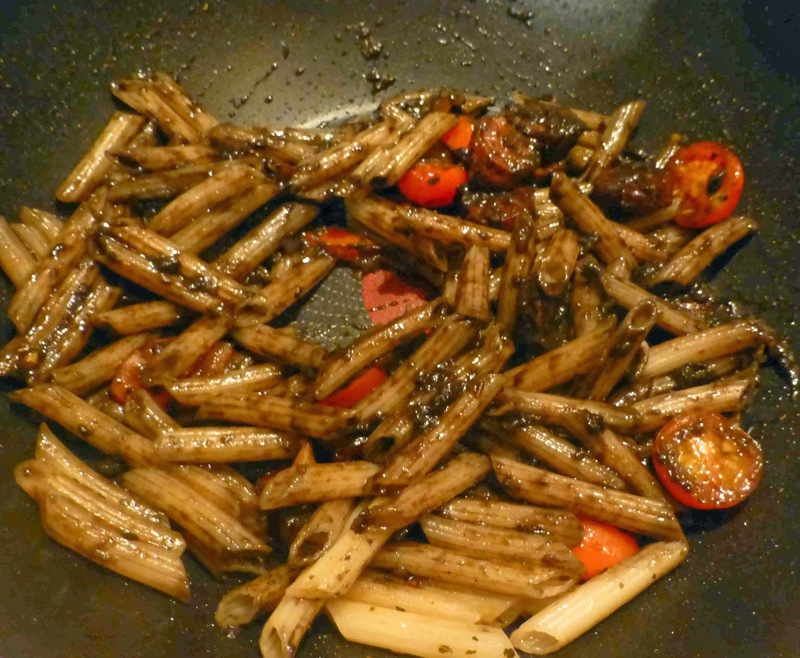 Squid ink is widely used (though not in Ireland) with pasta, noodles, rice and also with the squid itself, with cuttlefish and scallops. But this was late on a Saturday afternoon and a bit late to be wandering down town. So, we had to make do with what was in the cupboard. No fish but we did have fresh chorizo from Gubbeen and some pasta, enough to make a starter. Enough to be going on with. 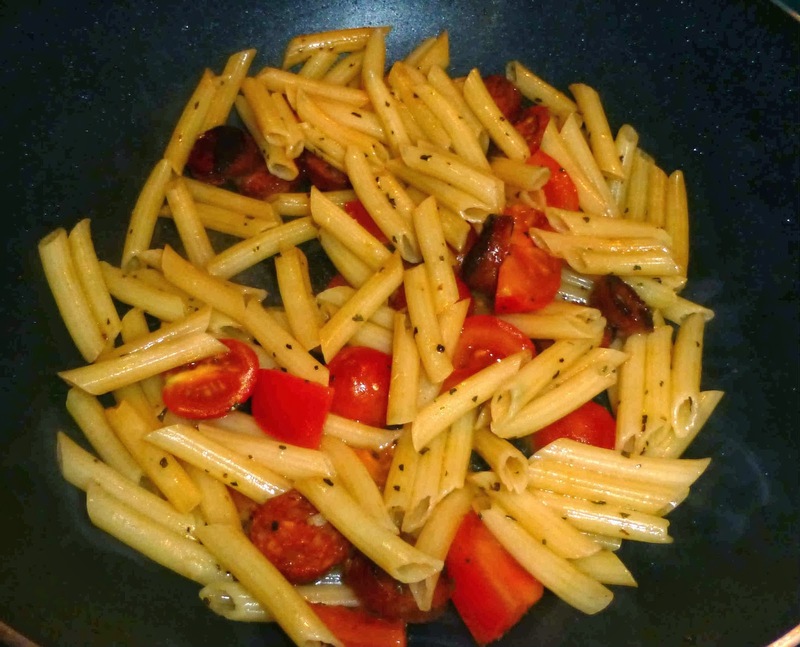 Soon the pasta was cooking and then came the transformation when the contents of the jar were added. Some cut tomatoes were thrown in and the moment of truth soon followed and it was fine, really fine. The chorizo soaked up the ink and were hardly visible among the general blackness but you knew for sure when you bit into one. Overall, the flavour was very pleasant indeed, not at all fishy, and the spicy explosions of the chorizo rings enhanced the whole thing. 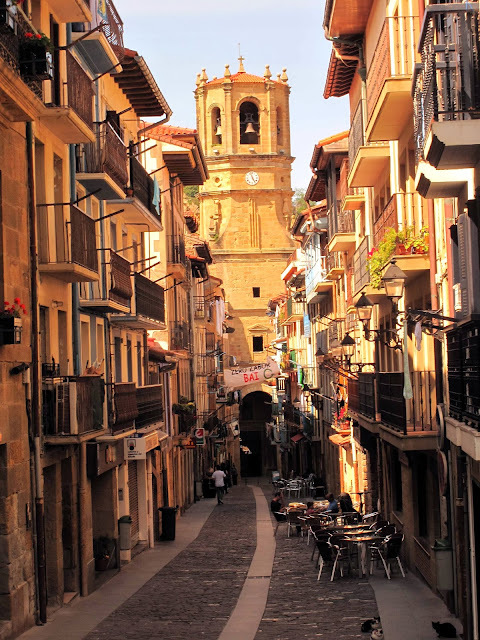 So, if you ever find yourself on the Basque coast, in either Getaria or Hondarribia, be sure and call into the shop of the family owned cannery Salanort. 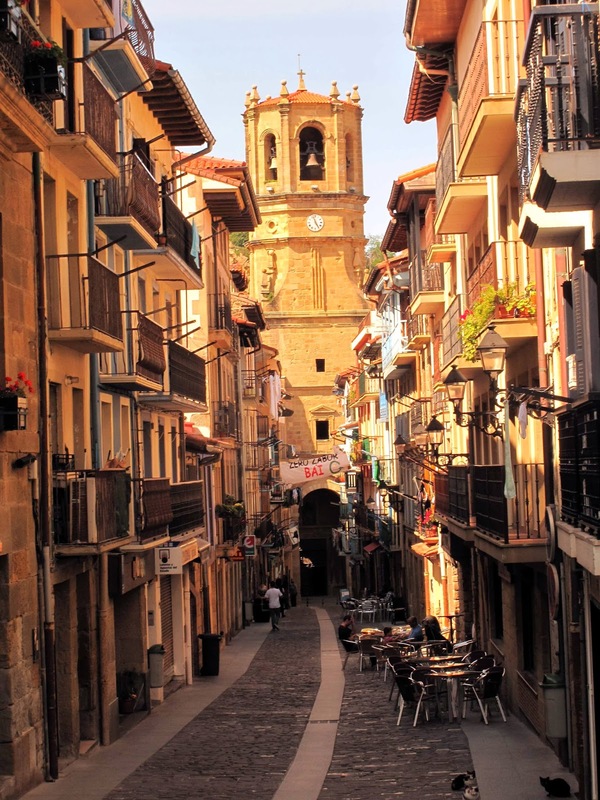 They also sell anchovies, bobito, tuna, octopus, sardines, and indeed some very good examples of the local wine, the very dry Txakoli. Had to have a bit of colour after that and it is provided by the classic bacon and cabbage. The loin of bacon came from the local Dunne’s Stores, a fine piece by Truly Irish. 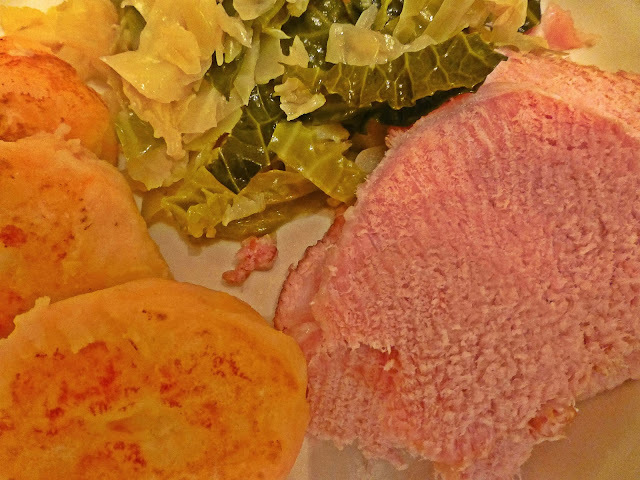 The cabbage and potato cakes (a mix of normal and sweet) added to the colour and the enjoyment. but a step up to Croissant & Butter Pudding! Having a restaurant on the number 208 bus route became a priority for us on a wet and miserable Friday night. It wasn't the only consideration of course but when Cafe Serendipity came to mind, it was an agreed yes. Soon we were stepping off the bus at the Western Road stop alongside the River Lee Hotel and crossing the road to the welcoming lights of the cafe. Our reservation was confirmed (the place was busy and would soon be full) and, without delay, we were at our table and studying the menu. We had been in before earlier in the year and once again were glad to see that they do things a little differently here (e.g. soup is cauliflower and blue cheese) and spent some time checking the choices as the guitarist began to play. We didn’t take the soup option but picked the Grilled Halloumi with red and green pesto and fennel coleslaw and also the Crab and Black Pudding with summer salsa and lime jelly as our starters. 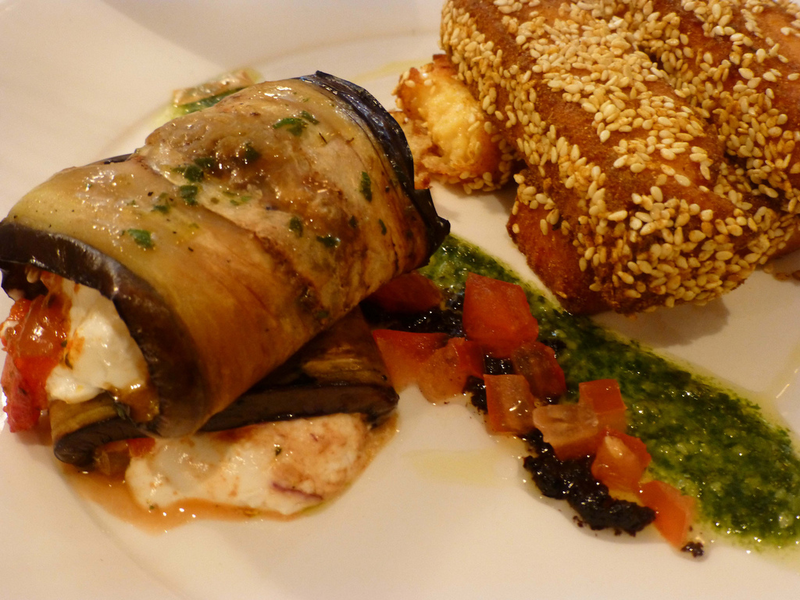 Getting used to Halloumi lately, thanks to the folks at Toonsbridge Dairies, and this was excellent, very tasty and the fennel was a new touch. The other starter was not quite as successful as we felt that the delicate crab was a bit overwhelmed but still it was a flavoursome dish overall and the lime jelly was a tasty touch. We could also have chosen the Smoked Chicken Salad or a Smoked Salmon Gratin. Service was excellent throughout, friendly and courteous and efficient, and we were not long in getting to grips with the main courses. 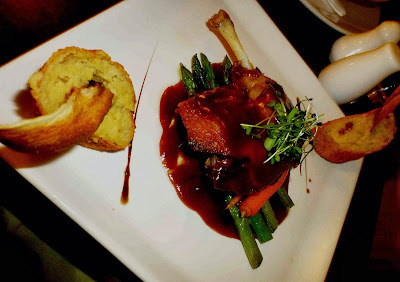 Mine was definitely the more eyecatching and it was the Confit of Duck Leg, chorizo croquette, baby carrots, asparagus, parsnip crisp and jus. Really enjoyed this one (above). The duck was perfect. so too were the vegetables, especially those little carrots, and the croquette was a flavoursome and slightly spicy treat. Duck also featured on our other mains. 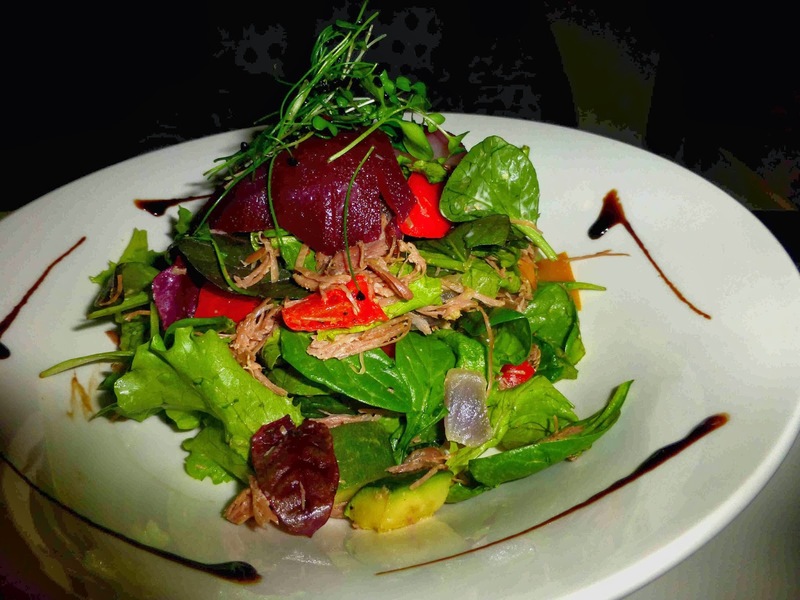 Here it was shredded in a Duck and Pear Salad, served with mixed lettuce and Mediterranean vegetable. Duck and pear always go well together and the salad was excellent, well prepared. A fine combination that could also be served as a starter. Other choices included Sirloin, Smoked Chicken Risotto, Pan Fried Hake (with buckwheat), and a Provencal Goats Cheese Tart. They had a short but tempting dessert list. 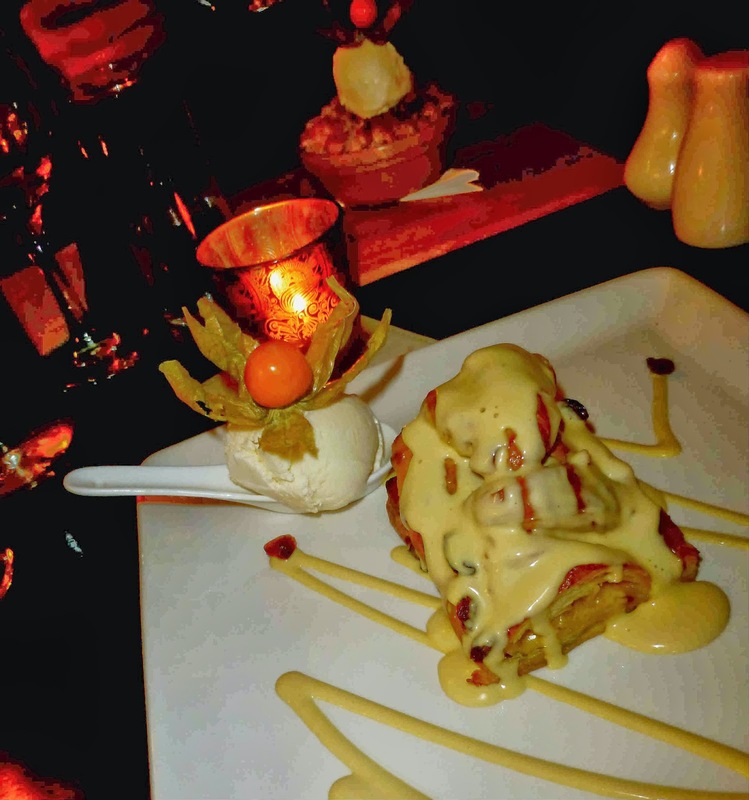 They offered, not your common garden Bread and Butter Pudding, but a scrumptious step up in class to a Bailey’s Croissant and Butter Pudding with Creme Anglaise. Loved that! CL’s special was the Apple Crumble. 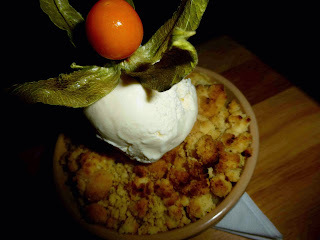 But that belied its humble title and, with a gorgeous thin layer of crumble and a great depth of real apple, matched mine. Soon after, two happy customers departed Serendipity and even a walk (it had dried up) to the bus stop at back of the block didn't dampen the feeling. Indeed, it was enhanced when that sometimes elusive number 208 turned up within seconds! 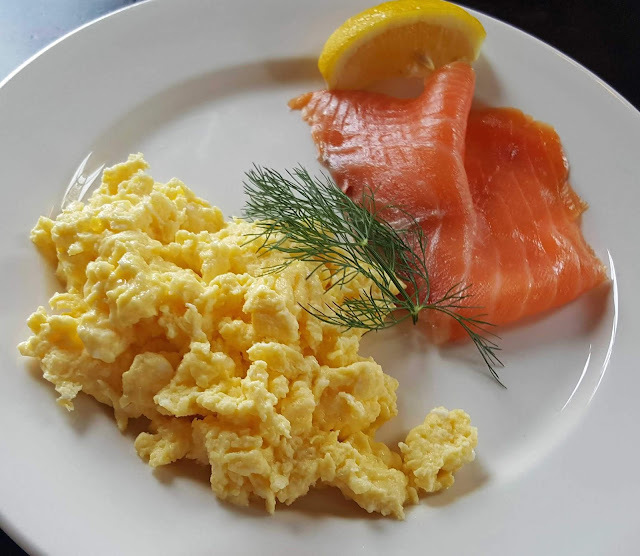 Quality at Cafe Serendipity is good and so too is the value, two courses for €23.00, three for €26.00. The wine list is rather short but most tastes are catered for with, for instance, Merlot, Cabernet Sauvignon, Malbec and Rioja available to those who like reds. Portuguese Pearls, one red, one white.